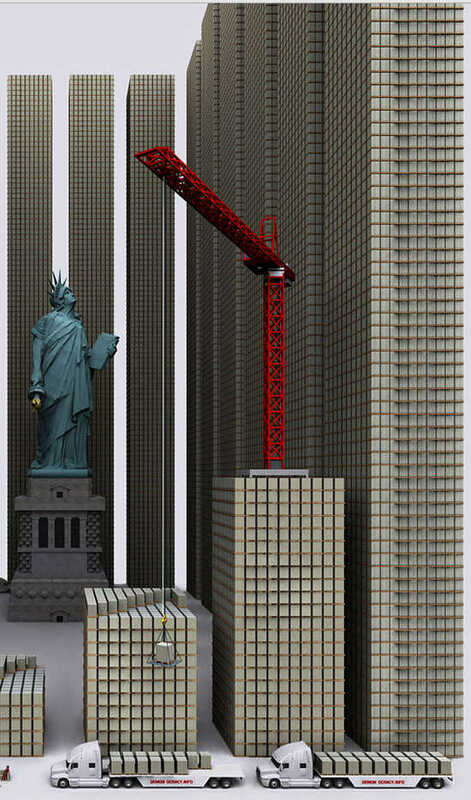 The above is roughly what 8.5 Trillion dollars would look like… and those are $100 bills. Take another look and let that sink in for a bit… I find it absolutely astonishing that the pentagon could lose track of this much money and for there to be no MSM coverage of this scandalous amount of mismanagement and fraud. Where is the demand for accountability? Why is the first question to ANY candidate for president not “What would you do about the massive fraud and waste at the Pentagon?” Where are the hearings, nay indictments, that are warranted when a sum equal to 1/2 of our national debt can be sent to the pentagon to never be accounted for. More below. We progressives need to work this scandal into every political conversation we engage in, especially when we talk to conservatives. Cutting government spending and accountability aresupposed to be core GOP values. Combine “Known” Pentagon waste (like the 1.5 Trillion dollar F35) with missing pentagon money and you have a good chunk of our entire national debt represented. Here’s an additional point : 8.5 Trillion dollars represents about $70,000 from each of the 123 Million US households. Also of note is this is scandalous because the Pentagon has been required by law to be “audit ready” since 1996, but still has no real accounting systems. An excerpt of a 1961 speech by President Eisenhower cautioning the people on the toil that the investment in military industrial complex takes on every field of human life, resources, freedom and livelihood. The relation between his words and the status quo of the world today is as wise as it is accurate. I, for one, am a huge fan of good news, the shiny silver lining amongst all the chaos happening in the world these days. For those readers that share the same liking, here lays an article that will warm your hearts and lighten your moods. These are a few stories from the past few days where Good done prevailed. Enjoy! Last week, ONE.org was able to prevent the planned cuts in the EU budget to help the world’s poorest, making sure that the already meager help offered does not suffer yet another slicing, further increasing the gap between developed and undeveloped countries. “When leaders arrived in Brussels last Thursday for what would become the final budget negotiation between governments, levels of development aid were being threatened with potentially deep cuts. But thanks in large part to your incredible campaigning in these final weeks, when the numbers were released, development aid to the world’s poorest was protected at current levels, despite cuts to the overall EU budget for the first time in history. Also last week, Greenpeace managed to reduce the deforestation happening in the forests of Indonesia, saving the endangered wildlife within and demonstrating that campaigns and large-scale pressure does indeed work. “Imagine for a moment the forests of Indonesia, buzzing with the sounds not of chainsaws, but of birds, and other wildlife that make them truly special. I’m happy to say we’ve just taken a significant step in the right direction to make this a reality. Starting March 11, 2013, EU finally decided to ban animal testing for cosmetics, making a stand for animal rights and setting a standard for the rest of the world to follow. “After decades of delays, disappointment and campaigning by animal advocacy groups, the European Union is finally set to enact its ban on animal testing for cosmetics this spring. It is also worthy of note the saving of a Bear Sanctuary in Vietnam by Animal Asia, home for 104 bears rescued from the illegal bear bile industry; the decision from Levi Strauss‘ management, announcing that they will stop treating the clothes with chemicals that cause toxic water pollution, following Greenpeace’s Detox Campaign and raising an ideal for other brands to follow ; the Great Sioux Nation reclaimed Black Hills taken from them in 1877 after congress disregarded a 1868 treaty and is now forever free to perform their ancestral rituals on their sacred land; and finally, thanks to the pressure from animal activist groups, the U.S. Military stopped the torture of animals for combat training adopting simulation training, a more humane and harmless alternative. Approximately every 80 minutes, a US military veteran commits suicide in the United States; for Iraq and Afghanistan, the numbers of veterans lost to suicide now outstrips casualty lists of those killed in action. The suicide rate for active duty personnel isn’t so shockingly high, but it’s still significant; in the first half of 2012, almost one soldier a day took his or her own life. Both veterans and combat personnel have experienced a steep rise in suicide rates since 2005, which notably marked a sharp increase in the intensity of fighting in Iraq and Afghanistan. While on duty, soldiers deal with high stress on a constant basis, with limited opportunities for decompression and processing. While counseling services are available and mechanisms are in place to flag soldiers as “high-risk,” such systems come with significant stigma, which can make people reluctant to report suicidal thoughts and other signs and symptoms of severe depression. They can risk losing their clearances, being discharged or being taken away from their units, which can serve to increase feelings of isolation and depression. Men was made to create, not destroy. Love, not kill. To go against our own nature will not only drain our energy, it will, in time, make us feel useless, depress and unaccomplished. The times for glory in the battlefield have dissipated with our evolution from the earlier states of society and primitive social mindsets. A developed being cannot find comfort in war when he understands that the dead of another human being makes less of him and the world. At a time that urges for global unity and cooperation, the blast from a gunshot might echo for a whole life.